Registration for 2019-2020 will be open on Wednesday, April 24, 2019 for all current students. Note: If the application is not completed, the child will not start on the first day of school. Please do not delay in completing the online application. Upon completion, the application will take up to 7 to 10 business days to finalize enrollment. If you are unable to complete the application or send the required documents electronically, you may register on site at 418 South Washington Street. 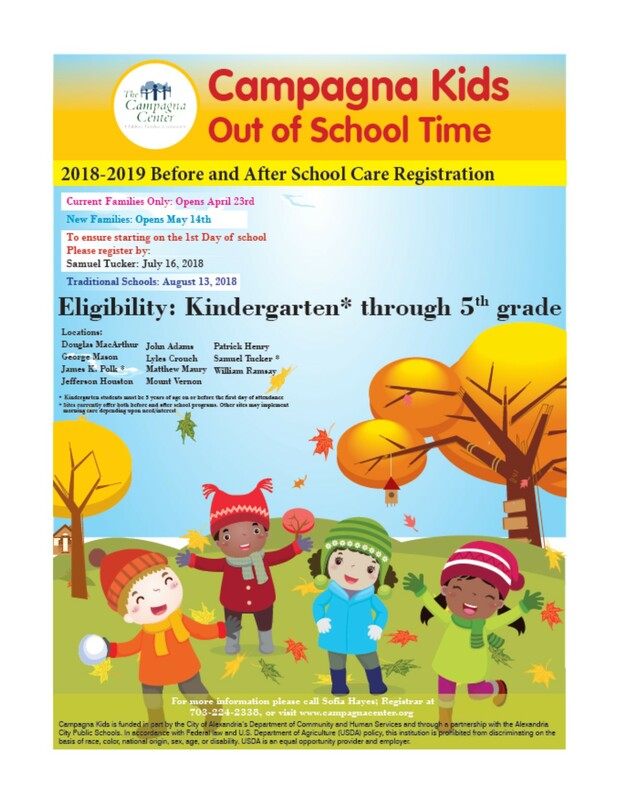 The hours of operation for registration are Monday, Wednesday & Friday from 9:30 a.m. to 4 p.m.
Si no puede completar la solicitud o enviar los documentos requeridos electrónicamente, puede registrarse en el sitio en 418 South Washington Street. Las horas de operación para el registro son lunes, miércoles y viernes de 9:30 a.m. to 4 p.m.
ማመልከቻውን መሙላት ካልቻሉ ወይም አስፈላጊ ሰነዶችን በኤሌክትሮኒክ መንገድ መላክ ካልቻሉ, በ 418 South Washington Street ላይ ጣቢያው ላይ መመዝገብ ይችላሉ. ለምዝገባዎች የሚሰሩ የስራ ሰዓቶች ሰኞ, ረቡዕ እና አርብ ከጥዋቱ 9:30 ኤ.ኤም. ከ 4 ፒ.m. Any forms you may need to submit with your application can be found by clicking the "Fees & Forms" in the menu to the left of the page. Thanks for choosing Campagna Kids!